This girl is practicing magic and is aspiring to be a great witch. Her specialty is potions and we' ll have to help her get as many as we can. We will have to make combinations with the different ingredients, joining three to create our potion. She herself will be responsible for testing the effects of their potions and there are a total of 12 different. You will have to mix ingredients to find the twelve spells in the game to complete it. You can become a boy, in the little mermaid or a bat among many other reactions. Do not wait any longer to have fun creating spells and potions in Audrey' s factory. 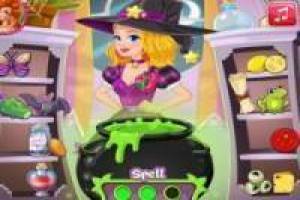 Enjoy the game Audrey Spell Factory, it's free, it's one of our magic games we've selected.